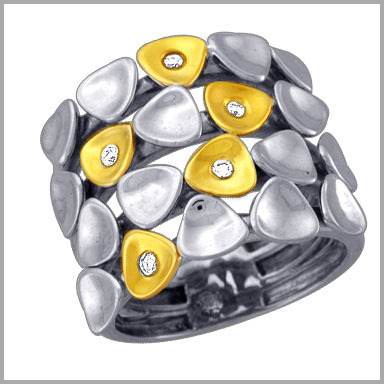 Sterling Silver / 14K Gold Diamond Four Row Petals Ring.0.900ct.Price includes 30% discount. This multi-level masterpiece shines with savvy style. This bold and noticeable ring is crafted in polished sterling silver and 14K yellow gold. It features four tiers of rounded petal designs. The gold petals feature 15 full round cut diamond in burnished settings. The total diamond weight is approximately 0.09ct with a color of H-I and a clarity of SI-3. The setting size is 11/16" x 13/16" with a height of 1/16".